The crowd-funding for the upcoming adventure game project from Tim Schafer's Double Fine Studios already broke all kinds of Kickstarter records weeks ago, when it reached its funding goal of $US400,000 in eight hours. It's passed $US3 million — which was the budget for Schafer's classic Grim Fandango — making it one of the highest funded projects ever on the fund-raising website. Double Fine's announced a livestream of the project's last few hours on Kickstarter, where we'll hopefully be able to see the studio's developers hard at work under a shower of money. The only reason they got so many donation is because Tim Schafer is NOT a douche. Whoa, I expected them to break 3 mil, but they've blown past with an extra $300,000! Were there a whole bunch of backers hanging out until the last moment? I want lunch with Tim Shafer. Pizza Hut all you can eat! Cheese Pizza, Pasta, Pepsi refills, Garlic Bread, Ice Cream, Chocolate Moose... Yum. I bet Tim Shafer is a Pizza Hut lover. 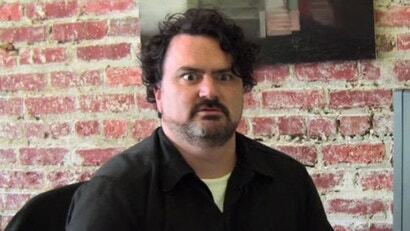 Every Tim Schafer story needs this image.